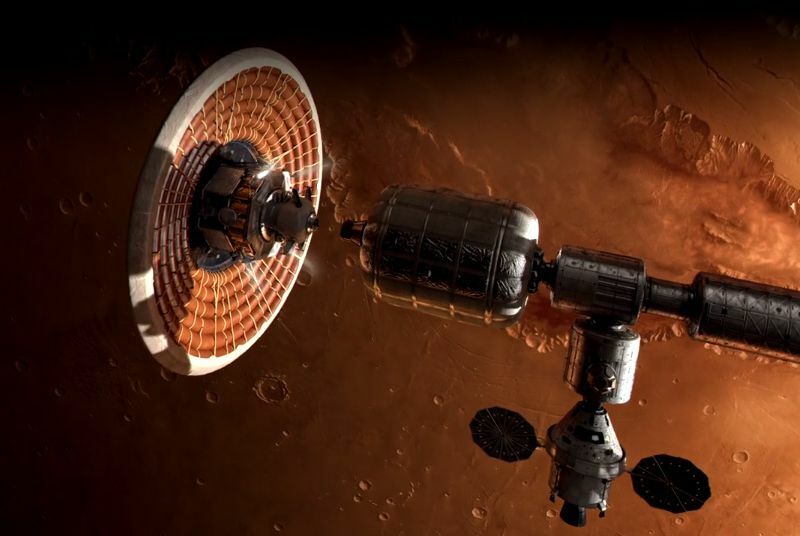 A new big-screen film documents the progress of NASA’s next big adventure. What does a washing machine have to do with the space shuttle? Nothing, really. But in Journey to Space 3D, a new IMAX movie, the two objects share some unexpected screen time when Endeavour, a space shuttle orbiter, rolls past a laundromat on its way to permanent display at the California Science Center in Los Angeles. The film, narrated by actor Patrick Stewart of Star Trek fame, examines the challenges of sending humans into deep space—specifically a round-trip voyage to Mars—but not before showing lots of love for NASA’s space shuttle program, which ended in 2012. Watching a shuttle launch was an exhilarating, humbling experience—all thunderous noise and harnessing of explosive energy. Journey to Space features footage from four shuttle launches, filmed at night and during the day. The camera’s point of view makes us feel like we are standing inches away from the shuttle launch stack (orbiter, fuel tank, and two solid-rocket boosters). We see the sustained violent shaking that the vehicle and crew experienced at liftoff. And after the boosters ignite during the final launch of Atlantis, the sudden imbalance of forces acting on the stack causes the orbiter to list slightly—but perceptibly—to one side. The film seems determined to show off the shuttle’s sculptural beauty, and shots of an orbiter barreling in for a landing at 235 mph and perched atop a 747 during a farewell flight over Washington, D.C. don’t disappoint. But as cool as the shuttle was, it was never going to get us to Mars. What will get us there is NASA’s Orion, and the second half of the film shows the space agency's new vehicle being tested at Kennedy Space Center in Florida. “There is no 911 in space,” says Serena Aunon, an astronaut working on Orion development, of the need for crew self-sufficiency. And there won’t be much privacy either. The living quarters inside Orion are so cramped that the four-person crew making the first trip to Mars will move to Olympus, an inflatable habitat connected to the Orion capsule. There the crew can sleep, exercise, and relax on the six-month, one-way trip. Journey to Space closes with a computer-generated simulated Mars landing. And when simulation becomes reality, we will have satisfied the long-standing desire to set foot on the Red Planet. “But even that won’t be enough,” says Stewart of humankind’s wanderlust. Journey to Space 3D opens at the National Air and Space Museum’s Lockheed Martin IMAX Theater on March 6. Tickets are available at the theater box office and online at www.si.edu/imax.